Discussion in 'Classic Manual Cameras' started by chuck_foreman|1, Aug 11, 2018. I've had the RTS at least a week and decided I would try the combination out. Not thinking too much about it, I mounted the lens and was off. As soon as I metered the usual scene I thought I must not have set the meter right .. but although the lens was completely shut down, the Fstop registration was showing F8 not F16 as set. The proposed readings were 2 stops off. I went back and then checked the other ML lenses I have, and they all registered correctly. I've examined the mount and can't see anything amiss or bent etc. Does the lens look something like this one ? I don't have any other Y/C cameras that show the Fstop in the display, but when mounted on other Y/C bodies ie FXD and FX2 it meters correctly ie not two stops over. ...OOhh I think I found the difference or problem. 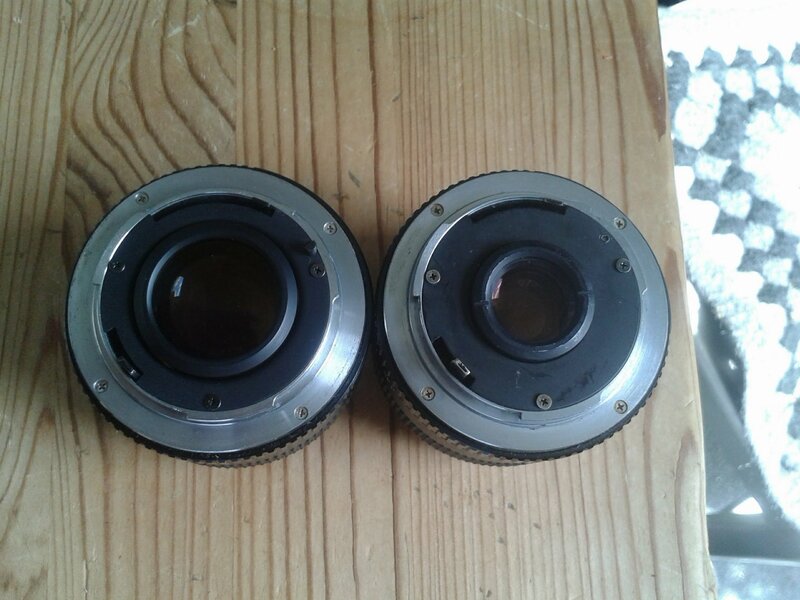 There is a post on other ML lenses and I can see a "hole" where this post probably belongs..See at 1:00 oclock on the left is a 50mm and on the right is the 35mm perpetrator. @kmac I would say it does look like that... can you show me the screw you are referring top in a better photo? The aperture stops on the lens seem right.. ie the full travel. On my pic the protrusion just after 12:00 is the endstop with space to travel back to 11:00. This is the aperture follower. Since it seems to work with other bodies, my guess is this "post" communicates the max opening and for many bodies this is not important, but the RTS uses this index with it'S meter, where the others simply measure what light is coming through, the RTS uses it's index to cross check the light. You say you get full travel of the aperture stops ... but are the aperture blades opening and closing at all the right "f" stops according to the aperture scale ? For example: do the blades look right at f22 ? do they look right at f2.8 ? I had an RTS2 a few years ago and seem to remember it was sensitive to aperture readout errors if the appropriate cam on the lens was even the slightest bit out. All indicators seem to point to this missing post. I thought it might just screw out so I took a DSB lens and tried to remove it.. .. I never did get it out it just sit there all wobbly now like a loose tooth. Rather than completely remove it.. I've decided not to make two broken lenses out of one. I will sure up the wobbly post with JB Weld or other epoxy. I'll investigate a replacement 35mm lens... but now regret the money spent on the 35mm! Examining all of my Y/C lenses I noted tha the ML and the DSB series lens have the same post. The only AE (T*) lens I own has a protrusion that is much wider, but of equal height in the same location as does the Tokina 28mm. Another after market lens also like the AE has a raised rounded protrusion. @stuart thanks for the insight.. mine definitely meters wrong with this lens but I can offset the meter the two stops.. which is what I did yesterday! OK 2nd time around.. out in the field.. now the aperture in the camera is still reading 2 stops higher than set, but. The metering appears to match another meter where before it seemed also of0f by two stops DUH!!!. I dbl checked this after I got home and now I have ..as usual.. totally tricked myself with this escapade... time to quit I guess!! What an idiot!! I still have a working RTSIII and an Aria. Be aware that the RTS, while an epically nice feeling camera, has electronics that are nearly unrepairable in the modern age according to my ex-Yashica contax repair person these days. Wonderful camera but tough to keep working. I bought 2 and couldn’t get either of them fixed. My RTSIII developed a slight problem but my Contax guy was able to get the parts for it from a friend in Japan but that was probably a one time deal. I love that thing though. Good luck with your lens.